Shake it up Baby, now, Twist and Shout! Wow, it's really been a while since my last post, hasn't it! I've been in Bristol for the past two weeks for my placement with Homes & Antiques magazine, and only got back home yesterday afternoon. I've really had such an amazing fortnight, I can't quite explain just how much I enjoyed it. I was given lots of jobs to do, and everyone there made me feel like I was one of the team. It's also made me feel a lot more confident in terms of career choice, I've been feeling worried lately about not having a clue of what direction I would go for after uni, but after my placement I definitely feel like magazine editorial work, or journalism, is the career for me! If you follow me on instagram, you might have seen that I finally managed to visit Bath, after wanting to go for such a long time. It's such a beautiful city and I fell for it pretty much straight away! There will hopefully be some pictures up soon! After venturing back home yesterday (on first class, might I add - but psst, it was only £2 more than a normal ticket! ), me and my family all went out for a meal at Smith & Western's in Tunbridge Wells (think Mexican style food in a Wild West setting! ), the portions were massive, and the food delicious. I had a veggie burrito and a vanilla milkshake, but I just about ate half! As it was my sisters birthday meal, there was a special surprise dessert, a massive glass bowl of everything sweet and chocolatey you could imagine, and I managed to squeeze in a couple of spoonfuls! Last week I received some amazing news, just in case you didn't hear me squealing with a mixture of joy and surprise from Bristol Bus Station, or see my super-excited tweets; I've been shortlisted for Cosmo's Best Newcomer award! I cannot believe it! So thank you so much to everyone who voted for me, I can't explain just how much it means to me! There's some amazing blogs being nominated, so I can't believe that my little blog has been too! Thank you, thank you, thank you!! But the voting hasn't finished yet, so if you like my blog, it'd really mean so, so much if you could take two seconds to vote for me as Best Newcomer! Glad to hear you enjoyed your placement! Bath really is beautiful and well done for the nomination, you deserve it! 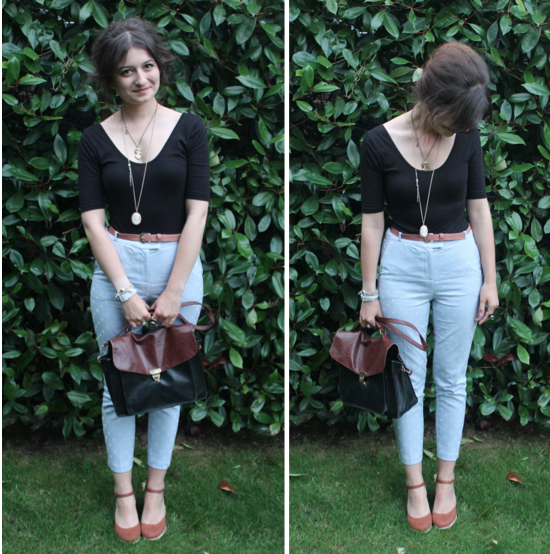 You manage to make high waisted look so good, I just look like a troll when I attempt the tucked in look! Gorgeous outfit, I love those jeans. Congrats on the nomination! All that yummy looking food is driving me crazy. Sounds like you had a great time, I've career choices in mind but I don't really know how to go about them, squeel! congrats on being nominated! your sisters birthday dessert looks incredible! you look so happy and adorable, super perfect my little murray mint! love your trousers! please just give me all your clothes now miss murray! aww im so glad your placement went well! YAAAAY my several email address voting worked, i will once more resume my many email address and vote once more! that pudding looks bloody yum! I have those trousers too! 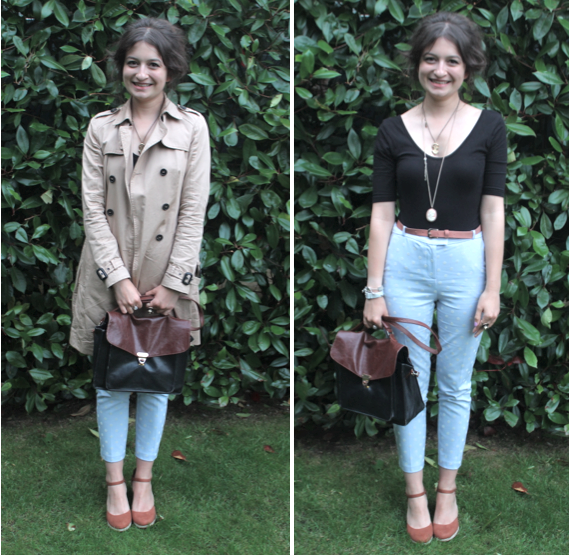 Wore them here http://thedustonthegroundblog.blogspot.co.uk/2012/06/i-miss-our-little-talks.html but I love seeing how you wore them - lovely outfit :) I'm deffo in need of a trench coat like yours!